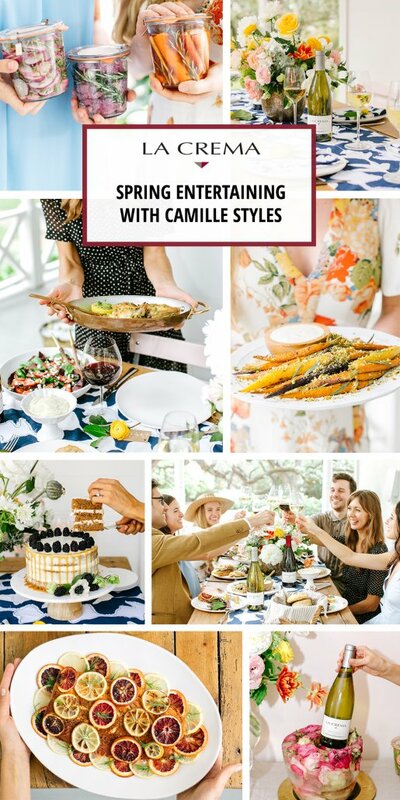 With spring around the corner, we teamed up with Camille Styles to help you plan the perfect gatherings to ramp up your spring entertaining game. 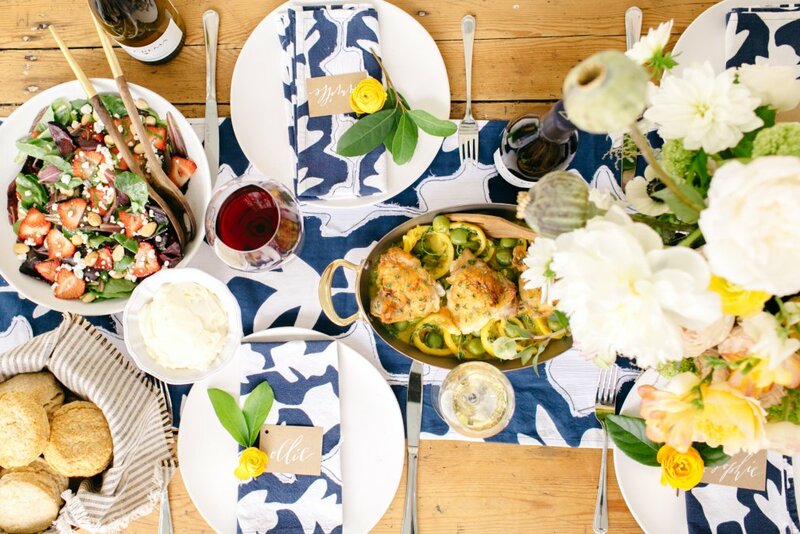 This spring, why not pick a free Saturday on your calendar and invite friends to your back patio (or a nearby picnic spot) for an open air dinner party? When warmer temps arrive, I want to eat as many meals outside as possible, and the season’s most colorful bounty provides endless options for a tabletop inspired by nature. 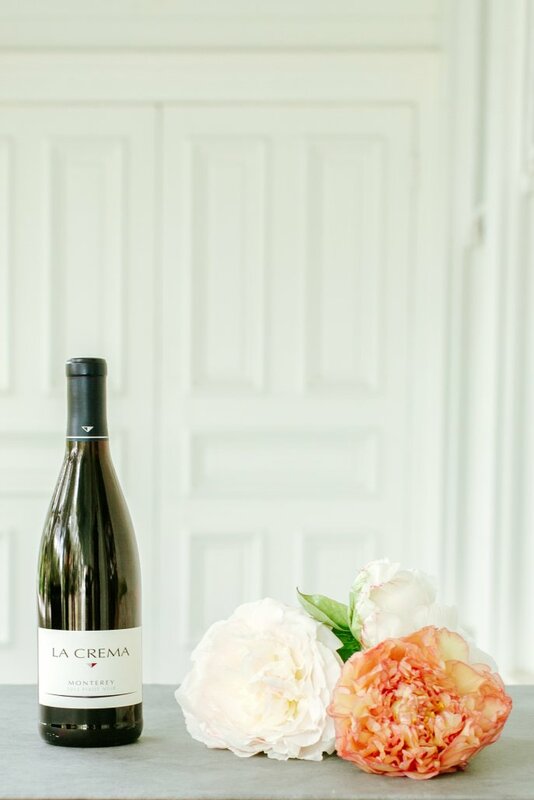 As a nod to my Texas roots, I’m planning to kick off the season by inviting friends to join me around a long farm table for a Southern-inspired menu paired with refreshing La Crema wines. 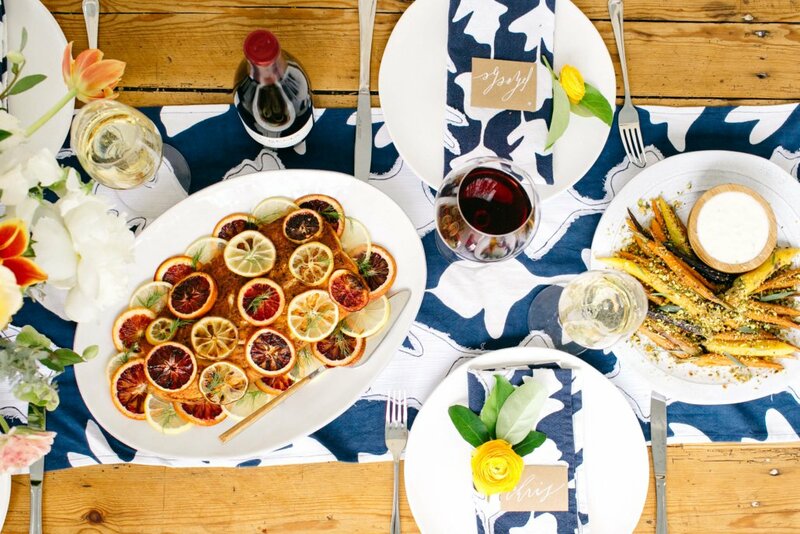 Keep scrolling for the recipes, pairings, and tabletop ideas, and cheers to an entire season of al fresco spring entertaining! 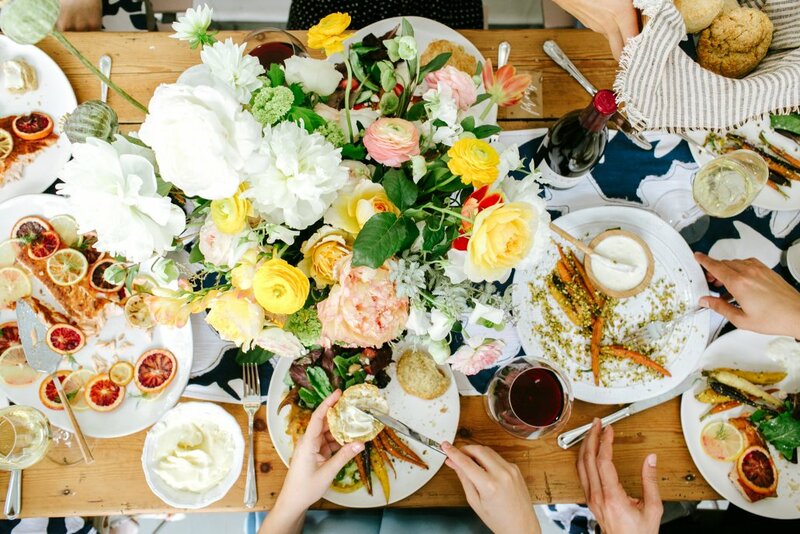 Southern entertaining is all about easy sophistication: breezy linens, bunches of happy flowers, and big platters of seasonal food set the stage for this meal. 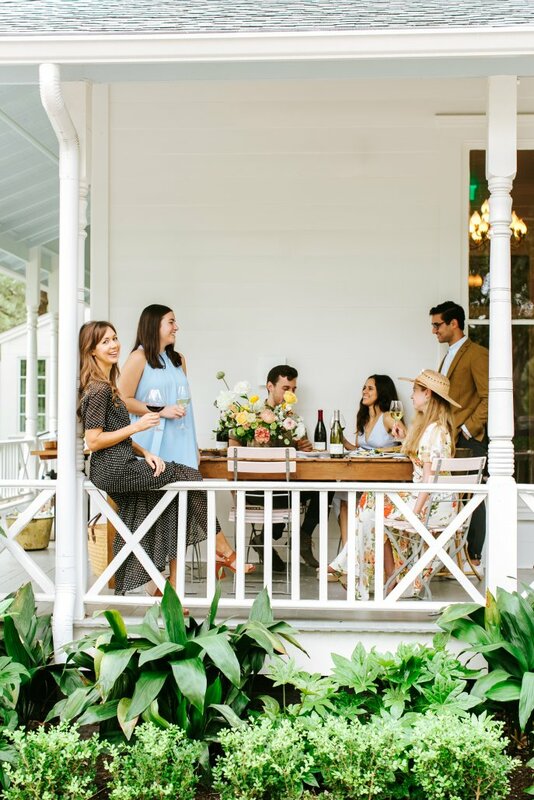 In keeping with the graciousness that defines a Southern host, I try to think about which details will make my guests feel comfortable, taken care of and well-fed. For a casual weekend dinner party, I always serve food family style. There’s nothing like having guests pass around abundant platters of food to get them mingling and enjoying a communal experience. 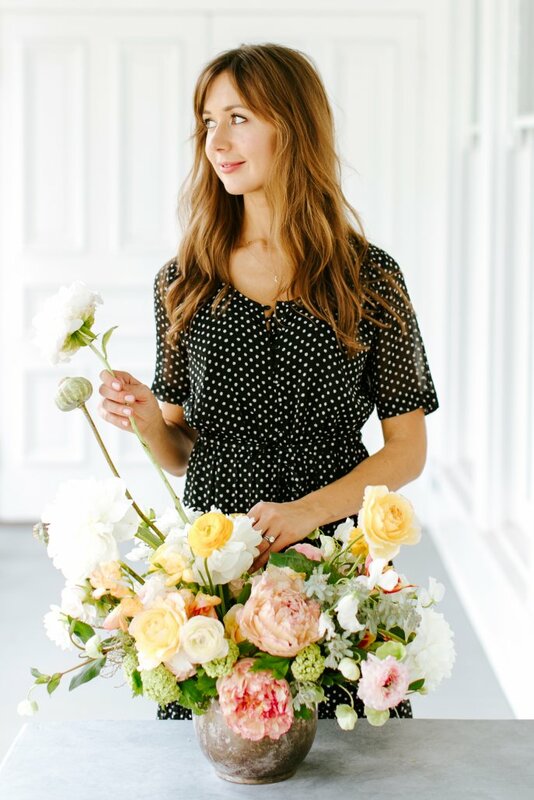 And since we’re styling for spring, a beautiful, layered centerpiece with fresh blooms is an absolute must! I love peonies since they’re big and textured and add a lovely richness to the arrangement. Usually I’ll accent them with smaller blooms like sweet peas, spray roses and plenty of greens to create an absolutely awe-inspiring tablescape. I love antique ice buckets for their charm. Make sure to have a few on hand, and maybe a larger one to store multiple bottles, so your white wines stay nicely chilled. And it’s sometimes a good idea to a put the Pinots on ice, just for a bit, so they don’t get too warm while you’re dining outside. 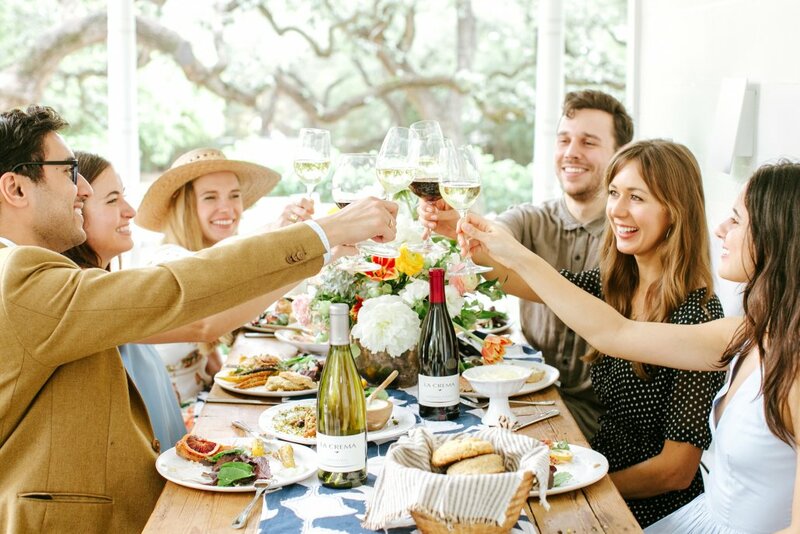 A fun way to elevate any dinner party is to suggest wine pairings with each menu item and let guests fill their glasses from the bottles on the table. 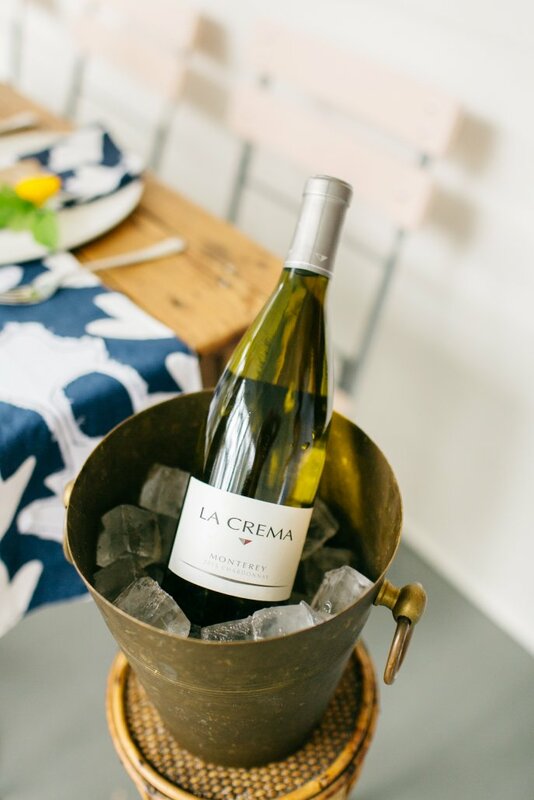 For this dinner, we poured four different La Crema wines and paired them with a Southern-inspired menu (keep reading!). As I mentioned, the goal of this dinner was to create a communal experience with platters of food for guests to share. From two different mains, a couple sides and our friend Walter’s homemade biscuits with lime-infused honey butter, the spread was one that created conversation and a relaxed atmosphere. This Baby Lettuce Salad with Goat Cheese and Strawberries is such a breeze to assemble as it’s really just 5 main ingredients: mixed baby lettuces, sliced strawberries, almonds (marconas! ), goat cheese crumbles and sliced mint. All it needs is a drizzle of olive oil and balsamic, a sprinkle of flaky salt (like Maldon Sea Salt) and you’ve got yourself a simple spring salad. 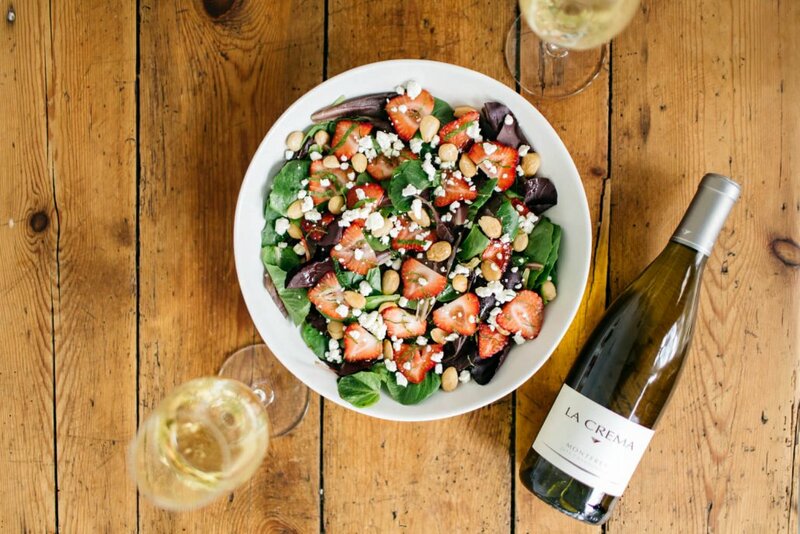 We paired this with the Monterey Chardonnay since the citrus and tropical notes in the wine along with its bright minerality made it a perfect choice for a simple salad. I love the color of this Rainbow Carrots with Yogurt & Pistachios side dish. Since rainbow carrots are smaller than your traditional bulk carrots, they roast fairly quickly whole and turn out nice and tender. Plus they have a sweeter carrot flavor than larger carrots. The pistachios give a nice crunch and the tangy yogurt infused with orange rounds out this side dish nicely. 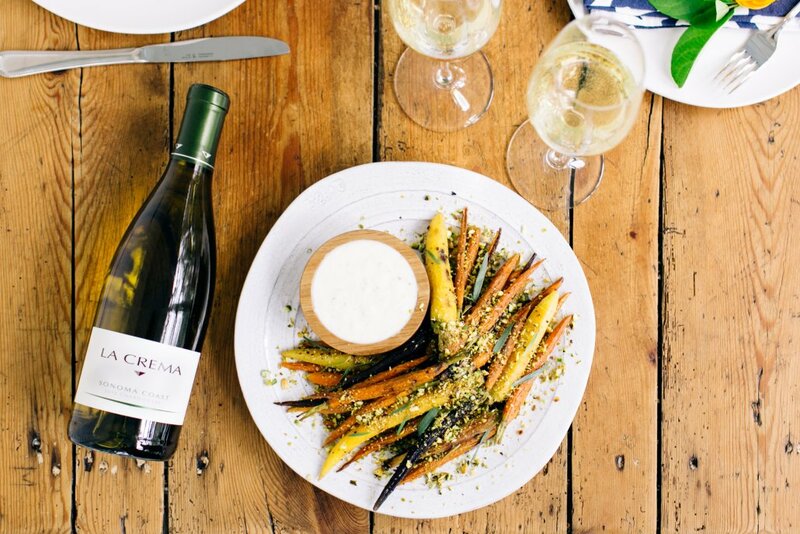 We optesd for the Sonoma Coast Chardonnay as a pairing option to this side since the acidity in the wine helps balance the creaminess of the yogurt, but complements the richness of the roasted carrots. 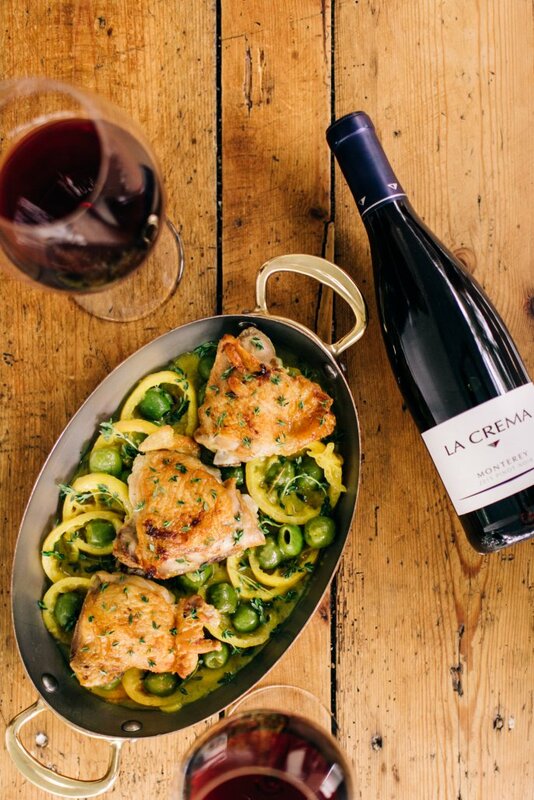 Given the cool-climate earthy notes in our Monterey Pinot Noir, we found it was the loveliest match to these Braised Chicken Thighs with Olives, Lemons and Thyme. I do love how easy this dish is to make and the relaxed Mediterranean vibes it brings to the dinner table. It really was a hit! You’re probably wondering what the trick is to making this simple Roasted Wild Salmon with Citrus, Chilies & Herbs look seriously party-worthy? It’s all in the garnishes. 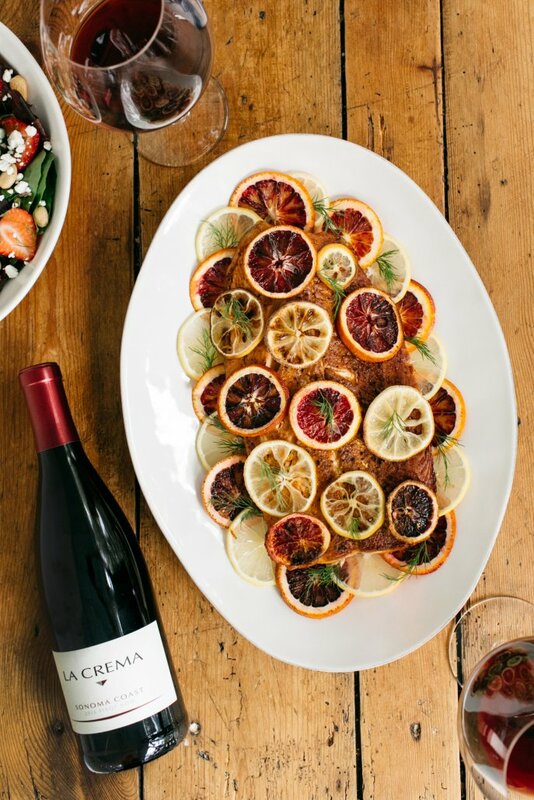 I bought citrus of every type and color, from lemons to tangerines to blood oranges, then thinly sliced them and layered them all over the top of the salmon in a fish scale pattern for tons of “wow” factor. And while you may think white wine as the go to for this dish (and it does work, don’t worry), we opted for the slightly lusher Sonoma Coast Pinot Noir to help balance the richness of the fish. 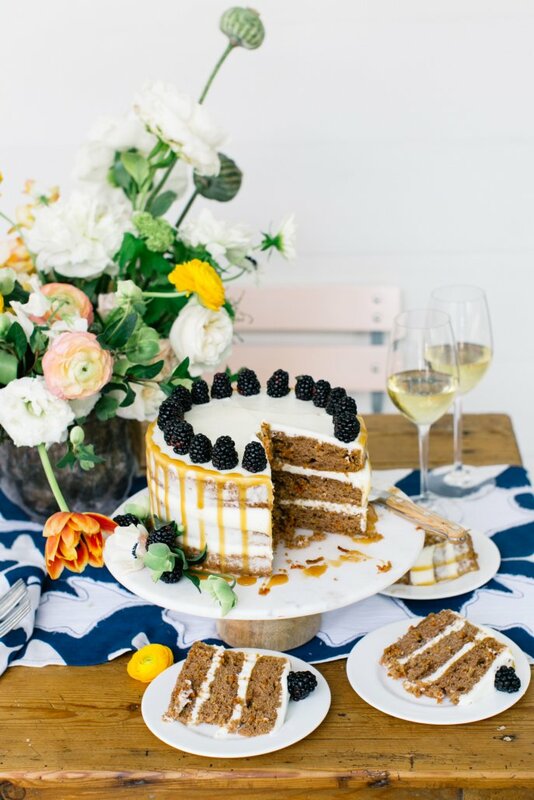 I’d never dream of hosting a dinner party without giving my guests a little something sweet to end the meal. I’m a proponent of picking up a delicious store-bought treat, especially if I made dinner from scratch – ’cause you know the hostess has got to enjoy her party, too! 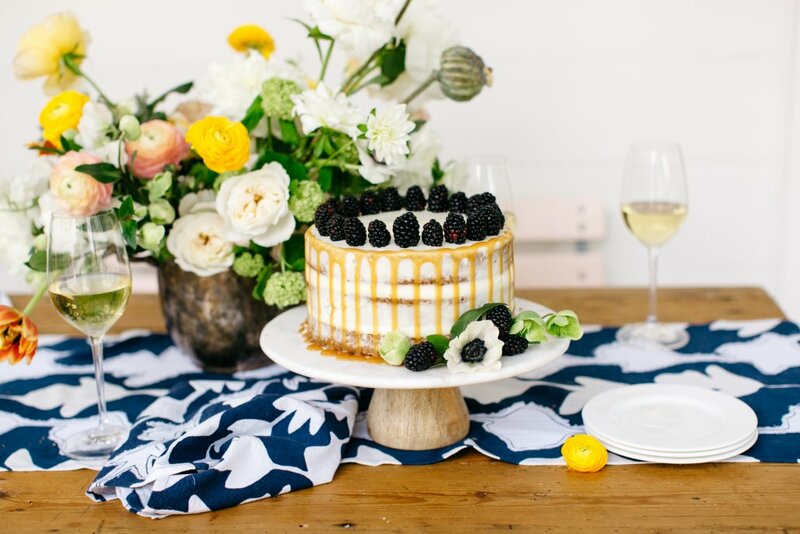 For this dinner, I picked up a brown butter cake from a local bakery, then drizzled caramel sauce down the sides and crowned it with blackberries and fresh flowers to dress it up. Needless to say, it was pretty stunning, don’t you think? 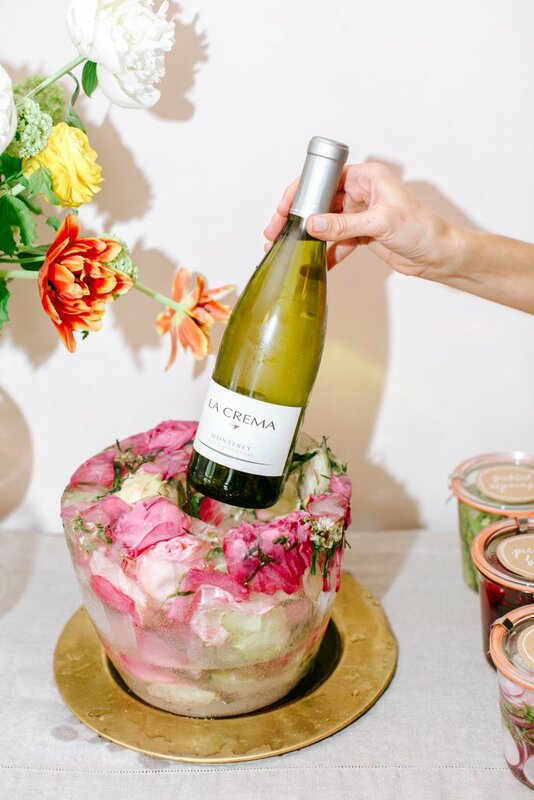 Now to really bring your spring entertaining game to a whole other beautiful level, I opted for a jaw-dropping floral ice bucket to really set the stage. I’m all about a self-serve bar as well so guests can feel at ease to wander and not have to rely on their hostess for refills of whatever they desire. 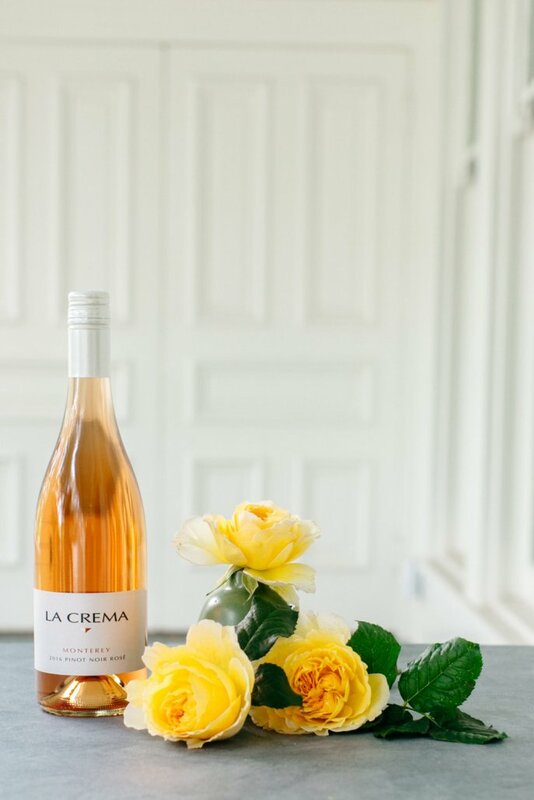 For a bit of fun, we wanted to find blooms that complemented a few of La Crema’s wines. 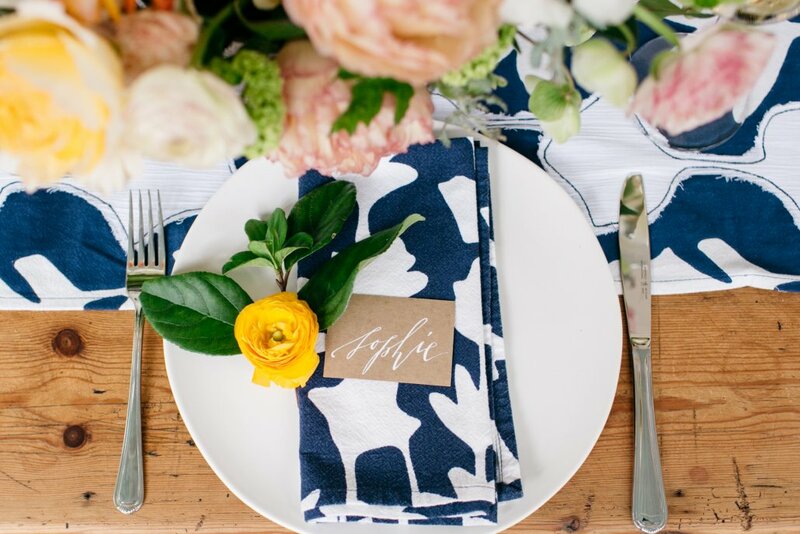 Use these tips to inspire your spring entertaining centerpieces and floral arrangements. 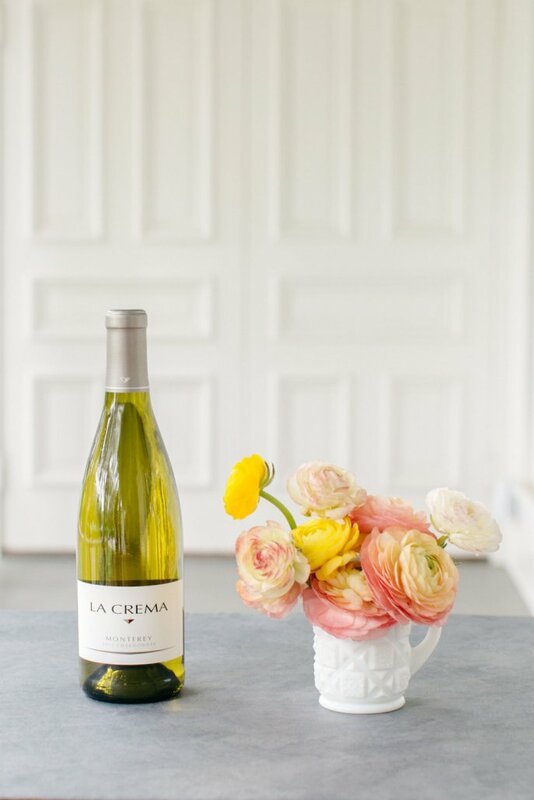 Fresh floral notes of Chardonnay meet their match in ranunculus, the happiest flowers of spring. Lushly layered petals make peonies an ideal pairing for the multi-layered fruit and spice flavors of Pinot Noir. 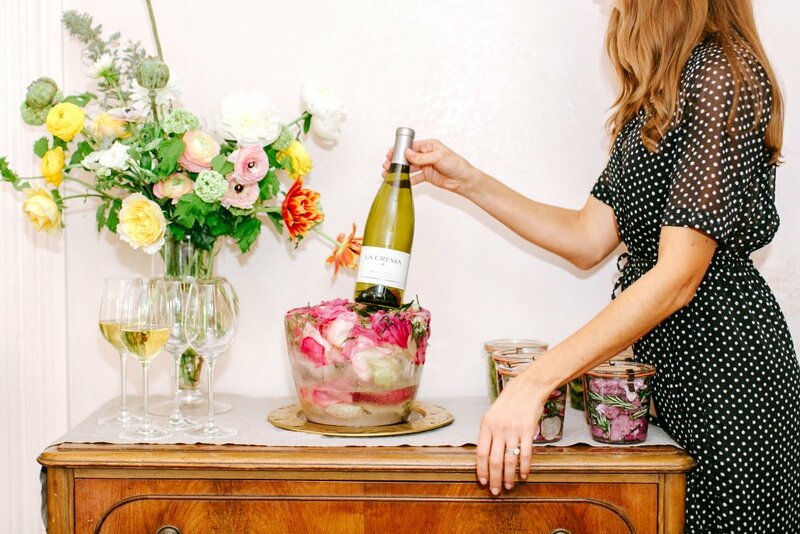 What flowers pair perfectly with Rosé? Lush, feminine roses, of course. The vibrant hues and romantic vibes make them the perfect match for the crisp fruit flavors of the wine. 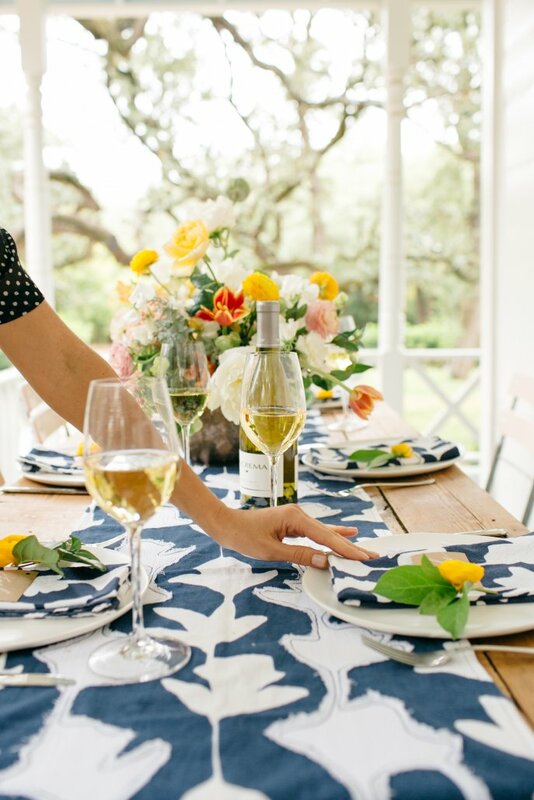 We hope your spring entertaining gatherings end up as lovely (if not lovelier!) than ours. Let us know how they turned out in the comments. Cheers! 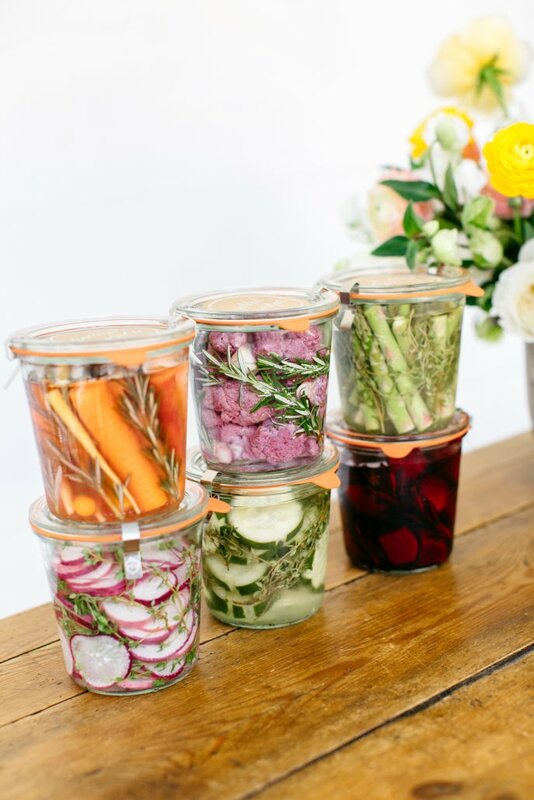 Share our Spring Entertaining tips on Pinterest!